If you are looking for a British Army officer’s service record have a look at this article: How to find a British Army officer’s WW1 service record. 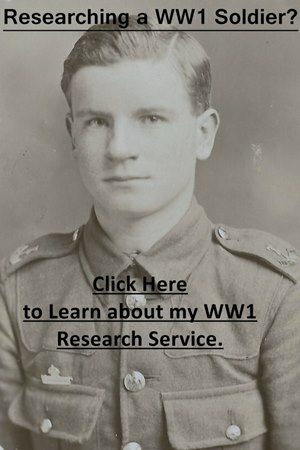 I have also written a series of other guides to help you research a soldier who served in the British Army: Guides to Researching Soldiers who Served in the British Army. Every soldier who served in the British Army had a service record which is the most important document to find if you want to learn more about their First World War service. Unfortunately, around 60% of First World War service records were destroyed during the Blitz in September 1940 when the warehouse storing the files at Arnside Street was hit. Even if a service record managed to survive the Blitz, many pages would have been lost in the 1930s due to weeding to save storage space. The easiest way to check whether a soldier’s service record is still held by the MOD if they were born prior to 1901 is by searching the UK, Military Discharge Indexes, 1920-1971 on Ancestry. Clicking on the banner below will take you to Ancestry. Only initials are shown and they are grouped together along with the date of birth of the soldier which is very useful for common surnames. The service number recorded will usually be different from a soldier’s number or numbers from the First World War. This is because the British Army renumbered its soldiers with an Army Number in 1920. If you don’t want to use Ancestry you can download and search the eight files which they combined for free here: Spreadsheets Ancestry have Combined for their Military Discharge Index. I have found that there are a lot of errors in the database, especially concerning dates of birth but it is still very useful. The service records which survived the Arnside Street fire became known as the “burnt documents” due to their poor condition and in many cases noticeable fire and water damage. They are held at the National Archives in both their original format and on microfilm. You will not be able to view the original documents at the National Archives due to their poor condition. Their catalogue reference is WO 363. If a soldier who left the army prior to January 1921 made a pension claim due to a disability arising from their service during WW1 then there’s a very good chance they have a service record in the WO 364 series. In order to process disability claims, the Ministry of Pensions was sent documents from a soldier’s service record. Most of these documents will be of a medical nature. You can sometimes find soldiers with service records in both WO 363 and WO 364. There are service records to nearly 23,000 soldiers concerning the award of a disability pension held at the National Archives in PIN 26. These records haven’t been digitized and are only available to view at the National Archives. The likelihood of finding your soldier is very small. However, if you don’t know their service number, then their date of birth, where they lived (the 1911 Census is useful) and their parents’ names can help. It is vital to know a combination of these details to stand a chance of finding the correct soldier, due to the possibility of a large number of service files surviving to men with the same name. However, if you are searching for a soldier with an unusual name then you should be fine just searching that name. If you have no information about their military service you can still look through all the search results to see if you can find a likely candidate based on their date of birth, family and where they were living. WW1 service records are available to view online on the subscription websites Ancestry and Findmypast and both sites usually have a free trial period. I would recommend using Findmypast as Ancestry’s search engine for service records isn’t very good. I have been unable to find service records on Ancestry no matter what I searched which I found straight away on Findmypast. Findmypast has also indexed all the service records so if a soldier appears in another man’s record this will be shown in the search results. Clicking on the banner below will take you to Findmypast. Alternatively, the records available on Ancestry and FindmyPast can be viewed and downloaded for free at the National Archives. Due to their poor condition, it is not possible to view the original documents. Many local libraries also have free access to the sites. Description of a soldier on enlistment recording a soldier’s height, weight etc. Biographical information including next-of-kin, address etc. Information about which battalion or unit a soldier served with. This is key when it comes to working out where a soldier served if he was in one of the corps of the British Army e.g. Royal Artillery, Royal Engineers.